Ok, so the Alexa hair didn’t work out – I have a fluffy mullet – but I ALWAYS end up with a fluffy mullet, so I am fine about it, really. What was most irritating about the whole hair salon charade was that I went to a new place, eschewing the usual exorbitant but lux Aveda to try out a new stylish salon run by a local couple whom I kind of know in order to Cheat The Man and support local business. Or something similarly worthy. So I took Ned, who is small enough to just lie there on the floor, alternating between animated slumber and small little mewling sounds which culminate in needing a breastfeed, looking cute and only slightly crusty around the eyes. And it was all very nice, and cool, with giant fading portrait photos of ancient Eastern European aristocracy in crumbling gold-leaf frames and art deco desks and a huge vintage cash register and new, unthumbed copies of Love magazine (surely Katie Grand’s white elephant?) and Italian titles. (I could spot no Grazia or Heat, dear Reader. I should have fled right then). 3. She looked for a grey hair, which I was sure she would not find, then found not just one, but a whole patch! A whole filthy patch! Which was conveniently located at the back of my head where I could not see – and of course now she has highlighted the phantom patch so no one else can confirm or deny it was ever there. Clearly, I do not actually have any grey patches, and she was just trying to make me feel OLD. In a mean hair-stylist kind of way. And then, she gave me the fluffy mullet which was another attempt to age me prematurely. And I think she won. Cow. And in other equally important news, the KitchenAid is shining smugly on our new shelves in the HALLWAY (ah yes, London flats are snug at best) and I have made two cakes already. Last night’s cake was so brown and chocolately and only a little bit squashed and this morning I was still feeling the proudness of new-cake-production and so I told the children they could have some when they woke up. Unfortunately, they did not eat anything else, turning down Shreddies and banana and peanut butter toast and so, shamefully, I am officially The Kind Of Mother Who Feeds Her Children CAKE FOR BREAKFAST. That is a new parental low (followed closely by the steady stream of morning TV and the worryingly infrequent teeth cleaning, etc, etc). Let this be a cautionary tale. 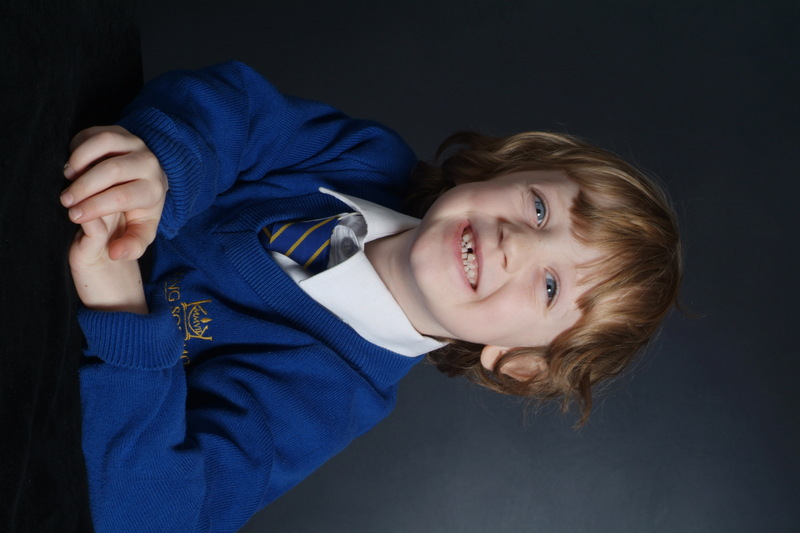 Below is the first school photo of Barnaby. Cute, yes, but NOTICE THE TOOTH. Cake for breakfast does no one any favours in the long run. I have been forced (yes forced by a refusal to eat anything else) to feed my girls chocolate and pre-packed chocolate muffins for breakfast. Their teeth are intact however Tui has developed a boil the size of Rudolfs on her nose and it is very, very red. so Dean has turned into a packet of Arrowroot biscuits….